That is a BEAST. Good going, Rick. She weighs 93,000 lbs. in working order! When we are done it will be a few pounds lighter as there are a couple of areas where we could lighten it up some. 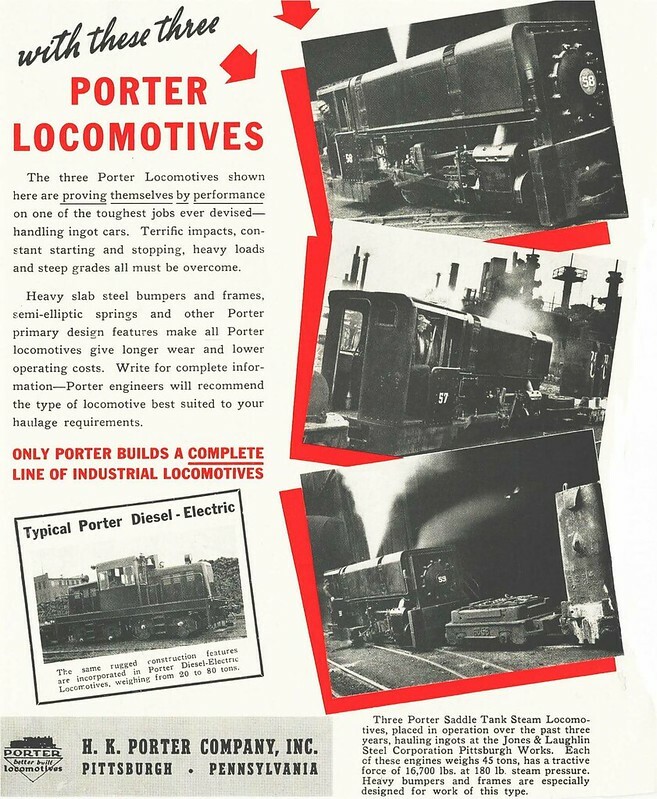 For these Porter locos, the ratio of weight on drivers to rated tractive effort was about 5.6. Generally for steam locomotives intended for road service the ratio was around 4. Sounds like the Porter locos in question were sure-footed beasts. Youngstown Steel Heritage is hosting our annual Fall Open House on Saturday September 23, so for the occasion I decided to put the saddle tank on the locomotive to show what the finished appearance of the 58 will be. I may bring the unfinished cab over from the "Coalburg Locomotive Works" aka my home garage and put it in place as well. While the tender looks extremely small compared to the locomotive, in many cases where saddle tank engines had tenders they were of a small size. She is going to be quite a beast when back in operation, now planned for spring of 2018. The photos from the marketing sheets do not do the engine justice, pound for pound that little brute is a pocket-sized superpower machine. I wish my scheduled allowed visiting on the 23rd from NE PA, but I always look forward to updates. I wonder what the "tale-of-the-tape" would be in comparing against her standard gauge cousins from Lima, Baldwin and Alco? I wonder what modern efficiencies could do to safely improve her as-built specs. 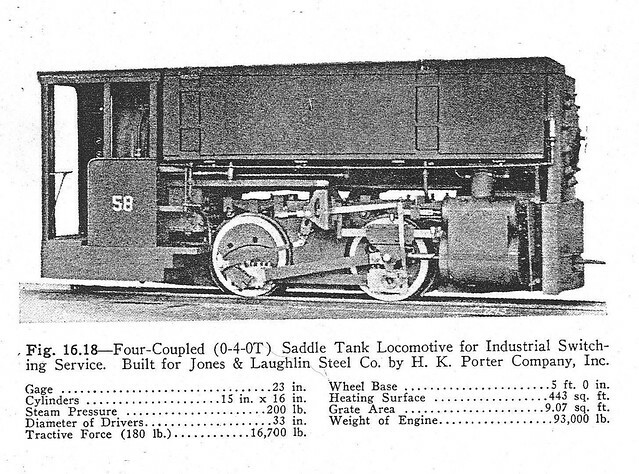 The first group of these locomotives were built with 200 psi boiler pressure and a tractive effort of 16,700 lbs. The second group of locos had 225 psi and a tractive effort of 20,800 lbs. Factor of adhesion at that higher pressure 4.47. For a locomotive 20' long and 8' tall riding on rails two feet apart, 20,000 lbs. is phenomenal. That is why we call her "Saddletank Superpower" ! Nice photos form the open house. I can't wait to see the boiler installed on that pocket-sized brute! Looks like the Brookville is getting a lot of love and respect too! Thanks! I figure that I might as well post those pics here too! Our little railroad is growing pretty quickly. I was recently interviewed for Nick Ozorak's The Roundhouse podcast. Work is continuing on the J&LNG on three fronts. First is extension of the mainline to the north property line. We have another 100 feet to go to get to the end of what we can build, and in there will be a turnout leading to a future engine servicing area. Second is the ongoing restoration of the J&L 58. Work on the 58 will be a bit more pleasant over the winter now that the west enginehouse doors have been installed and window panes installed. Just a little more trim work to do and the enginehouse will be complete. Third is the rebuild of our 5 ton Brookville, J&LNG 64. I am just about ready to put the regauged wheelsets under the frame, then we start remounting all of the drive components. The original flathead Ford V8 and manual transmission was trashed and is being replaced with a 302 and C6 automatic transmission. It will take a bit of shoehorning to get everything to fit, but ought to be an improvement over the old drive. We plan to begin limited train operations in May, being open and running on Sundays from Memorial Day to Labor Day. Initially the Brookville will be our motive power until 58 is completed and operating. Merry Christmas from your friends the Ohio two footers! That is one tiny enginehouse. What was its prior function? I built it for the 58. It is 10' x 20', just big enough for the locomotive.